It’s a funny thing with committees. You just dip your toe in, help out with a stall at the fete here, offer to count the take for the raffle there. You think you can take it or leave it alone, but before you know it you’re on your third gig as Treasurer and no end in sight. It has to be said that it’s an excellent way to find out about an organisation, be it a school or a choir, and you meet the nicest people on committees. Utter nutters too, but you learn to spot those and develop a quick left dodge. So I find myself on two school committees this year. Another funny thing is that I don’t think I’ve ever gone along to a committee meeting or talked to a committee member and volunteered for anything. I just find myself on an email list with a commitment to leave the bosom of my family every fourth Thursday night. Here’s a tip, if you really don’t want to be on a committee, and someone you know who is on one offers to buy you coffee or a drink, run screaming in the opposite direction. As soon as you agree to just pop along to Sarah’s place tomorrow night and just meet everyone, you are so gone. There’s a cocktail party at the Horror’s school tonight, rained for the third year in a row into the hall. The president of the committee I’m on at this school just loves the school colours and has fairly firmly suggested that everyone on the “exec” as she’s jovially calling it wear black and white tonight and possibly forever more. There are two ways I could go. I could cop out somewhat by just wearing a black dress and trying to blend in with the crowd. Or alternatively I could join in enthusiastically and wear the white dress I bought on a whim from Dotti because it was forty bucks, sling on a black jacket and make a matching black and white necklace. Oh yeah. You’d think I’d have run out of black and white inspiration after the end of last year’s efforts, but it just keeps coming. I’ve added a touch of orange, I believe that’s part of the livery colours but I’ve only seen it on stationery. 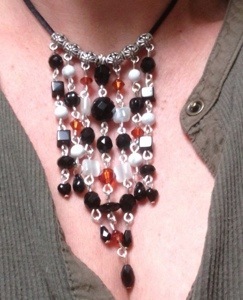 For those who are interested, it’s Swarovski Red Magma. And because the Horror is only in fourth grade, I’m going to be associated with this school for a long time. This isn’t the last of the black and white necklaces.